What determines the cost of professionalism? 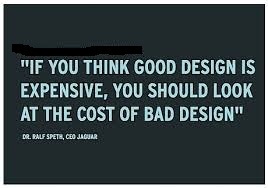 However true the picture may be telling, there should be a measure to the cost of a good design. Anyway, so I was wondering. I have some ideas of how to birth some of my passions but I realize I need the expertise of some professionals to form them to shape and bring it enticingly to life to attract the right market. However, I notice the trends in professionals’ charging. Perhaps because they know they have something you need but don’t have to birth your desires, they charge outrageously and I’m wondering, in all honesty, are these things they help provide so expensive, even when they don’t need to purchase any form of raw materials themselves to serve you? Or is it just their own personal desire for more money so they exploit ignorant people in their areas of expertise? I would like to understanding the yardstick for charging for services generally, if there is any such thing. I believe in honesty and integrity which will speak farther for you than the dubious ways people go about extracting people off people all in the name of providing a service. I may be speaking out of my good heart, but what do I know about how the world works and what the business world appreciates. Prince of Persia: Sands of Time – Still Expecting a sequel? Rejection As The Best Motivation?